I’ll admit that I’m not a fan of diets, detoxes, or any kind of eating fad that causes people to eat crazy (usually tiny) amounts of foods (or food-like substances) that they will not continue to eat once they have fallen off the wagon and returned to pre-diet eating. Yo-yo dieting, fad dieting, and even doctor-supervised dieting (hCG!) are recipes for disaster. Diets mess with your hormones, your metabolism, your mindset, and your ability to function in the real world. My real world includes chocolate, doesn’t yours? 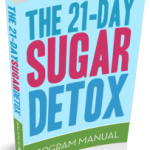 That said, I purchased the program guide for the 21-Day Sugar Detox (henceforth referred to as the 21DSD) almost two years ago, and I finally did the detox in January 2012. I did not have weight to lose, I was not dealing with any particular health problems, but I was curious. That and the fact that the program was written by Diane Sanfilippo, a Paleo nutritionist whom I admire and respect (you can read my review of her NY Times bestseller here). So I bought the guide, read it a few times, and determined that it was something pretty darn wonderful. I also determined that if I ever wanted to recommend it to anyone, I should experience it myself and know what the heck it was all about. The premise of the 21DSD is that we are overly dependent on sugar, sweeteners, and carbohydrate-heavy foods for our energy and this dependence wreaks havoc on our health. Consuming sugary, sweetened foods, and high carbohydrate foods on a regular basis leads to cravings, blood sugar roller coasters, and overeating, which can then result in more serious health complications such as obesity, diabetes, and heart disease. Too much sugar can also cause dental problems, contribute to candida (yeast) or bacterial overgrowth in the intestinal tract, or exacerbate autoimmune conditions. In short, sugar does nothing good for us, but it can do a whole lot of damage. For those who feel their cravings are out of control, or for those who would like to have more stable blood sugar and energy levels throughout the day, the 21DSD is an excellent starting point that will increase sensitivity to sweet things, reset metabolic processes, and cleanse the system of toxic food-like substances. Again, I’m not a big fan of detoxes and cleanses since I believe that our bodies will function well when they are fed real, whole foods, but if you are eating a Standard American Diet, you are likely eating a whole lot of garbage. The 21DSD is a whole food program comprised only of real foods chosen to nourish and heal your body. The nice thing about the 21DSD is that there are three levels to choose from depending on your dietary starting point. Level 1 is for anyone who is currently eating a Standard American Diet and allows some grains/legumes and full-fat dairy, but eliminates sugars, sweeteners, most fruit and starchy carbohydrates, and all gluten-containing grains. Level 2 further eliminates all grains and legumes; Level 3 eliminates dairy. The program is structured so that you can work with your own individual lifestyle (there are modifications for vegetarians, athletes, and pregnant/nursing moms) as well as your individual food preferences. No one will force you to eat liver, but you can if you want to. Likewise, you can decide to make a detox-approved smoothie every morning for breakfast, or eat eggs and bacon. Stay within the parameters of the program and see the results! I don’t eat a lot of sweets (or fruit for that matter), and I didn’t before the 21DSD, but doing the detox made me a much better label-reader. You’d be surprised where I found sugar and other sweeteners: spaghetti sauces, BBQ sauces, salad dressings and other condiments like mayonaise and mustard, spice blends, beef jerky, deli meats and sausages, gum, and more obvious places like flavored yogurt, fruit juices, and desserts. Add up all that sugar and by the end of the day you’ve consumed way more than you thought you did. And that isn’t taking into account any whole fruit you might have eaten. I found that by eliminating all of those sweetened foods for a short time, I was able to reset how my tastebuds recognized and processed sweet tastes. Fruit tasted much sweeter, as did some vegetables. Some desserts that I had previously enjoyed were unpalatable for me and left me feeling weighed down with the sweetness. Another benefit of the detox was discovering new recipes. I have always been an adventurous eater, and I love to try new recipes, but this was different since I was learning to forego some of the “staples”–bread, tortillas, roti, crackers, pasta, and oatmeal. Instead I ate bunless burgers, Mexican salads and lettuce boats, Indian food with a bit of rice or cauliflower rice instead of the roti, raw veggies, spaghetti squash and zucchini noodles, and eggs for breakfast most days. And they were all delicious! I also tried some new foods. Can anyone say coconut butter? Love that stuff! 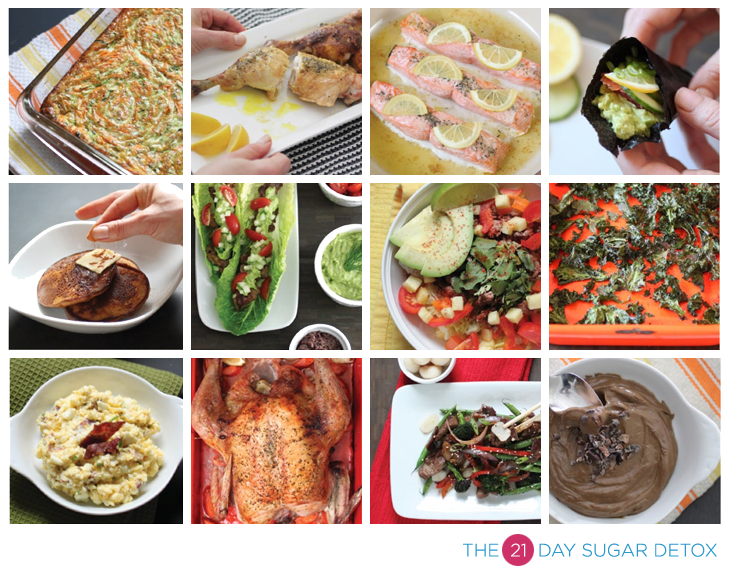 Look at all this amazing food–all 21DSD-approved! I also eliminated all forms of gluten (anything with wheat, rye, barley, spelt, kamut, or oats), something that I had been moving toward, but had not done for more than a week at a time (darn those homemade rotis!). I found that after a few weeks without bread in the house, I didn’t even miss it. I learned to bake with nut and coconut flours, but more importantly, I learned to rely on real, whole foods more than I had done before. And many hidden sources of gluten are easily replaceable or omitted. Once I made up my mind, it really wasn’t that hard. After completing the 21DSD last year, I became more involved with the program and started volunteering as a moderator for the 21DSD Facebook page. Last month I became a Lead Moderator, and I have also written a few articles for the 21DSD blog. I’ll be posting an article soon about how to modify the detox for kids. If you are at all interested in changing your eating habits, eliminating sugar, gluten, grains, legumes, and/or dairy from your diet (even in the short term to test your sensitivity to those foods), or getting off the sugar-energy roller coaster, the 21DSD is for you. A new group of detoxers begins at the beginning of each month (although you can begin anytime), and you can sign up for daily support emails as well as checking in on the Facebook page. I also provide private 1:1 and group coaching. As a final note, for those of you who are interested in following the 21DSD (or who already have), I have tagged all of my recipes that are 21DSD-approved so they are easier to find. 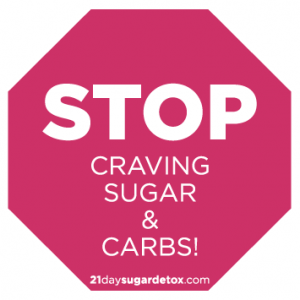 Just do a search for 21DSD and you will see how easy it can be to eat sugar-free! 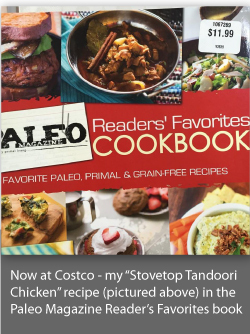 If you’re interested in purchasing the online version of the program (which includes lifetime access to eCookbooks, meal plans, supplemental guides for modifications, and a member-exclusive forum), you can click here (I am an affiliate and receive a very small percentage for referring you to the program). You will receive free updates whenever the program is revised. Please feel free to email me at rebekah at halfindiancook dot com or leave a comment below if you have any questions. Picture credit: All photos come from The 21-Day Sugar Detox. This post is linked to Tasty Traditions and Fight Back Friday. Have you posted the article about how to modify the detox for kids? I am Krishnamoorthy Iyer, 40, from Mumbai (Bombay), India. I am extremely keen to attempt a sugar detox program as I am curious to know whether it will positively impact my energy levels — I often feel tired and lethargic during much of the day. This is unfortunate, since I love and enjoy my work a lot — I am a grad student in an extremely demanding subject, a sub-field of Electrical Engineering and Applied Mathematics known as Information Theory. I am also about 10-15 kilos overweight and would love to get back into shape. I am a vegetarian (and intend to stay that way), and if your program caters to us and/or if you know of groups in Bombay that are currently undergoing a sugar detox program, I would very much appreciate it if you could/would put me in touch with them. Hello Krishnamoorthy! Yes, I think a 21-Day sugar detox would greatly improve your energy levels. Weight loss sometimes occurs, but sometimes it takes a bit longer for the body to adjust to a new way of eating. Regardless, eliminating sugar from your diet has only positive effects on your health. The program is not recommended for vegetarians, but if you are willing to eat eggs and some seafood, then it could work well for you. I don’t know of any coaches or groups in Bombay, but you may be able to find a coach who has online groups and participate that way. I’ll be holding another group (both in-person and online) later this year–if you’d like, you can join my email list (there’s no obligation to buy anything) and I’ll let you know when it is going to start. You can also search for a coach that is starting a group soon. Best of luck to you!